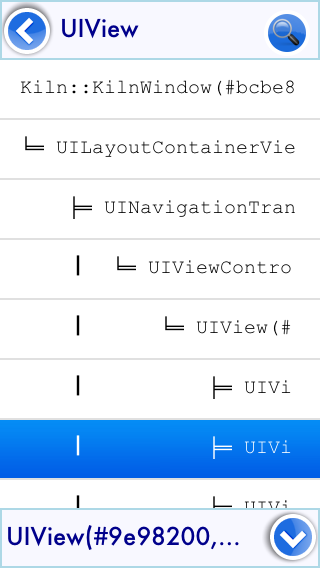 Developer tools for iOS. Runs on the device, no browser or computer needed. And if you want the email features, add app.frameworks << 'MessageUI' to your Rakefile. During development we rely heavily on the simulator to quickly view and test features, but often when we finally install our app on a device, the experience is not up-to-snuff with what was going on in the simulator. Views are off by a few pixels, performance is not what we expect, and crashes occur where we never saw them in the simulator. Sometimes these are device problems, sometimes it has to do with dropping in and out of signal, all sorts of scenarios that we cannot easily test for in the simulator. 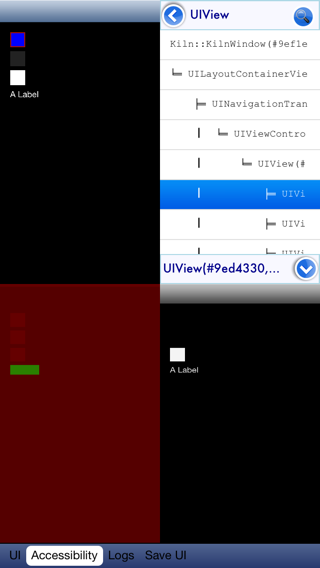 And of course there is the problem that iOS devices have more features than the simulator! Bluetooth 4, for example, is not easy to get setup in the simulator (and you have to buy a USB bluetooth module). My thesis is that we need to make on-device testing a more enjoyable and useful testing environment, so that we are compelled to test on it sooner and more often. Motion-Xray is such a solution. 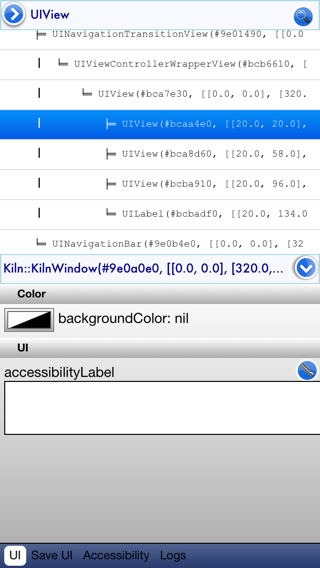 During development you can use Xray as a UI inspector, or to monitor the console log, preview how accessibile your app is (to blind and color blind developers), or you can create a plugin that provides information specifically useful to your app. Below I'll show how to create a new plugin. Check out the plugins folder for some examples. That's enough to have the Motion::Xray.toggle command fired whenever you shake the device. If you want to use some other mechanism that launches Xray (a complicated gesture recognizer would be a good candidate), you can call Xray.toggle (which calls either Xray.fire_up or Xray.cool_down). The Motion::Xray::XrayWindow class is only used to listen for the shake event, so using it will not affect your app in any other way. If you touch this area, you can get a quick preview of the view, or you can quickly change to another view, or change orientation. After a few seconds, Xray will automatically be displayed again. If you want to leave the Xray debug area, you should shake the phone again. 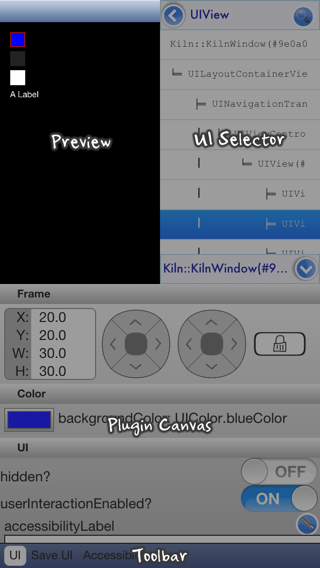 All the views on screen can be selected here, and a red box will show the bounds of that view in the Preview pane. If you touch it again, that view will be sent to whatever plugin you have visible, or you can press the "down" button in the bottom-right corner of this pane. Not all plugins respond to the selected view. 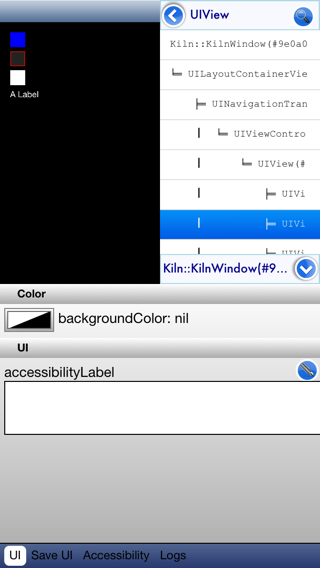 For instance the accessibility plugin will always display the entire screen, regardless of which view is selected. The log plugin, on the other hand, displays the inspect information about the view. 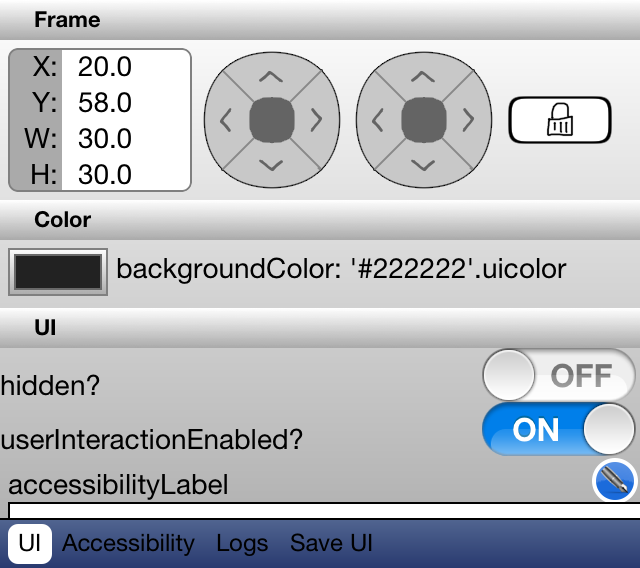 And of course the UI plugin will change so that you can edit the properties of that view. The button in the upper-left corner expands this view, so that you can see the tree easier. You can tap a view to get information about it, or press and hold to make that view "go away" so that you can choose the view behind it, or double-tap to select that view. If you inherit from a view and you want to disable one of the editors, assign nil as the editor for that property. UIWindow does this to prevent editing frame, hidden, and userInteractionEnabled properties from getting changed. Return your editor in the edit_view(container_width) method. You don't have to use the entire width, but your editor view can't be any wider. If you want, you can return a "preview" that just shows the value, with a button that opens a much larger editor. ColorEditor and TextEditor behave this way. To get the value of the property being edited, use the method get_value. It will introspect self.target looking for a the appropriate getter method. Whenever the value changes, assign the new value to set_value, and that will fire a XrayTargetDidChangeNotification notification, which is used by Motion::Xray::SaveUIPlugin. set_value will, like get_value, look for an appropriate setter. The editors should be able to be used for many properties, but if you're writing a one-off editor, I suppose you could call the getters and setters directly, but you should post the XrayTargetDidChangeNotification notification if you do this. 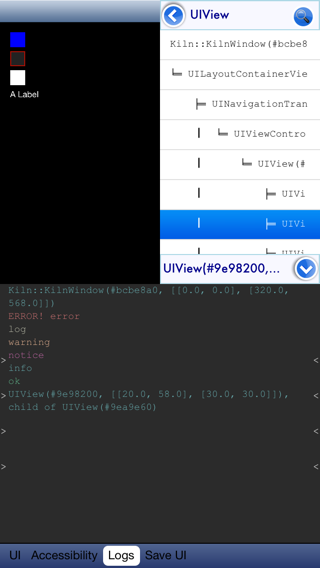 After you have made your changes to your UIViews, you will want to save those changes, right? This plugin is your friend. It is not included by default, though, because not everyone uses teacup or pixate. Change the type of output that you want. The default is teacup, but it is possible to setup the SaveUIPlugin to record NUI or Pixate changes as well. This plugin provides two screenshots of the current screen. One that mimics how a sightless person would "see" your app, and another that mimics how a (very) color blind person would see it. Each one is at best, an approximation, but the goal is that having this quick metric handy will encourage more developers to spend some time on accessibility. A little goes a long way! This plugin generated a lot of excitement when I announced Xray at the RubyMotion conference, #inspect2013. We had all heard [Austin Seraphin's][austinseraphin] talk the previous day, about how to improve accessibility. This plugin tries to provide a visualization of the recommendations he gave us - first and foremost, he recommended that you should at least set the accessibilityLabel on custom views. The left side shows a screenshot of your app with only red and green squares. Green squares mean "you're doing OK". It does NOT mean that your app has "good" accessibility, but at a minimum you should at least get all your screens "in the green" before you send your app to an accessibility consultant. 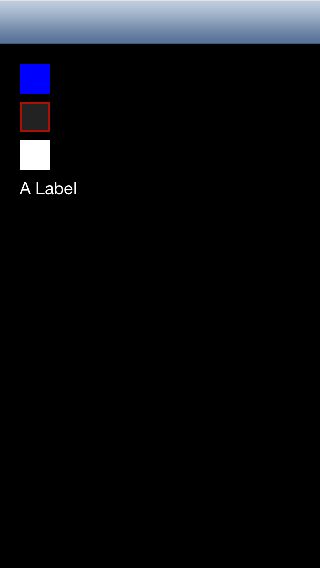 The other screenshot is a your app in black and white, with colors desaturated. 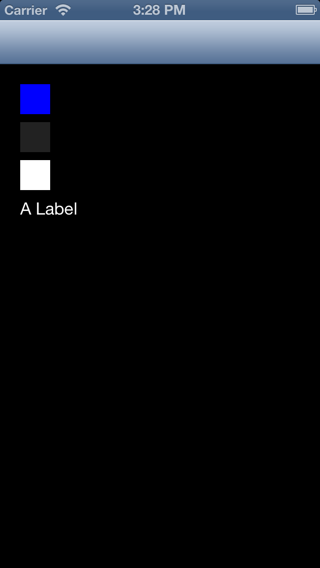 An attempt to mimic how a color blind person would see your app. There are many types of color blindness, and down the road I would love to see a few different screen shots for each specific type in this pane. For now, it takes the "common denominator" approach, which is to remove all color. # only log information greater than or equal to log level "warning"
Or you can write a log method yourself that calls one of the Motion::Xray::Log methods. If you use CocoaLumberjack, it should be very easy to hook up Motion::Xray::Log, but it will have to be done in Obj-C I think (I took a stab at it, but gave up when I couldn't access the message property). The upside to using these Motion::Xray::Log methods is that they use pretty coloring, they output to both the console and the Xray log, and I'm planning on including some awesome-print-like features to the log methods in the future (or, more likely, delegate to awesome-print if it's available). Building an app that interacts with bluetooth devices: How about signal strength? Devices detected? Connect and disconnect buttons? Building a game: framerate, number of textures on screen. To find out when the performance breaks down on the device, you can't trust the simulator! So, let's get to it. I will use some code from AccessibilityPlugin in this example. # call `addSubview` on this object. When the plugin is activated, we should grab a screenshot of the app and assign it to each view. The show method is called on a plugin when it is selected. edit(target) - called when a new view is chosen in the UI picker. You should call super, which assigns this view to the target property. Then you can update self.view with any changes that you need to apply. Register your new plugin in the AppDelegate#application(didFinishLaunchingWithOptions:) method. Xray depends on geomotion, which I don't feel bad about, and SugarCube. I would consider removing the SugarCube dependency, because not everyone uses it, but SugarCube adds a ton of benefit (like #to_s and UIColor additions). Generated on Mon Apr 22 04:31:35 2019 by yard 0.9.19 (ruby-2.5.1).